Most are back from Holiday travels, and to welcome the New Year, we have just received our first trunk show of the New Year, and it is a great one, Susan Roberts http://susanrobertsneedlepoint.com . Susan Roberts has one of the best selections in the canvas categories that you might want to stitch. Now here is what we have received in this show;; belts, ornaments, including, 3-D, and ornaments with musical inserts when finished, (these can be very hard to find), two sided Santa’s, Tree toppers, nutcrackers, Full size standing Santa’s, 3-d candy houses in multiple sizes. Now, beyond the Christmas themes, we have pillows in a huge variety of themes, we have tooth fairy pillows, chair seat covers, beautiful growth charts, baby sleeping door hangers/pillows, great selection of bricks, dog collars, and children’s belts, just to name a few of the categories that we have here. As always we will special order for you during the show, and give you the trunk show prices. These prices are great, and much below, the regular prices, I have not had a discount on fibers along with a trunk show in a while, but with this one we will, as we also have some new fibers to introduce as well. So with your first canvas, over $50.00 you will receive 10% off on your fibers. When you have spent over $100.00, you receive 20% off on fibers. The caveat here is, you need to buy ALL the fibers the same day as you purchase the canvas, and there are no exceptions to this rule. Now on to the new fibers from market...Planet Earth Fiber has introduced 16 new overdyed Pepper Pot colors and 18 new Planet Earth silk colors as well. We have these in stock, and we are also still carrying the 6/-ply overdyed and solids as well. In addition, Threadworx has new overdyed cotton and silk floss, which has arrived. 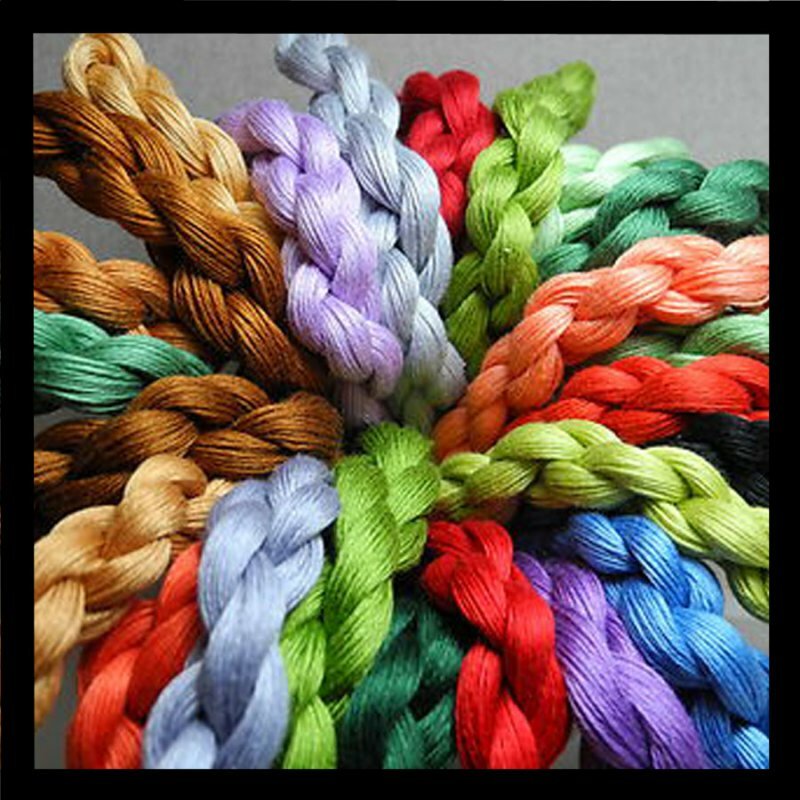 Silk Lame Braid, has new colors which are here, as does Entice. We are also receiving the new Rainbow Gallery Capri, which is good for both 13 and 18 ct. and the colors are bold and beautiful. This show will be here until early March, so get here fast, as the pieces have already running out the door and I literally just finished checking them in late last night. I had a customer come in early this morning to pick up two fibers and she purchased a 3-d Christmas tree to stitch. So don’t think you have any time to waste. This show does go fast. Check the website, find your favorites, and if we do not have them here we can certainly order them in for you. Next Trunk shows to look for, are Purple Palm and Labors of Love which will follow in early and mid March. Now on to other newsletter items, …..Trunk of Treasures, it is overflowing, ,,,full of goodies, that are new and wonderful. If you are looking for a small to a larger project, come check this out. This is also a great way to get a new person started on a project –(this can be a cheaper project) – and remember the money goes back to the person that brings the project in. (with the exception of the commissions listed below for our keeping track of the money) And for those of you who may be new to my newsletters and are not familiar with the trunk, Go through you stash- this is what the Trunk is for, we all have those treasures that are since being treasures in our life, and maybe now is the time that you want them to move out of your life and into someone else’s life. Why not get a few dollars for them. Place them in a clean bag, with a price on them and bring them in. If they come in to us with the bag and price, we take 5% -if sold the first month; 6% if sold the second month and 7% if sold and subsequent month. If you do not want to handle the bagging and tagging we can do this for you but we will up the percentage to 10% for the bagging and tagging process. Totally up to you. Now for another related item that regarding trunk of treasures money-and local robberies-that have required that we take cash home each night. As many of you know, there have been quite a few local robberies, including in this building were the robbers have taken only cash. As a result, I am taking cash home each night, which includes the trunk of treasures cash as well. So to keep track of this, rather than the former envelop of cash, we are tracking this on the card, and will just pay when you stop in, and record the date that you pick up your money. Please though when you are in, check with us to see if you have money due to you, this is your responsibility. When we are working with you as a customer, many times the last think on our mind will be that you have trunk of treasures money due to you. This winter has not been much of a winter, especially compared to last year, however looking out the windows today, we have snow everywhere, but just keep in mind, spring is just around the corner.!!! Keep Stitching, We Will Make it to those Warmer Spring Days! !